Get your spin on with the Confetti Spinning Top Timer! 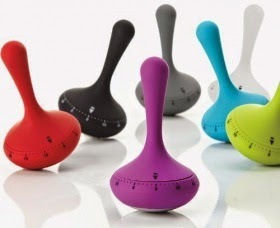 This fun grey designer egg timer from Zone Denmark is a brilliant way to cook your food to perfection and keep you occupied while you wait! The timer is made from red ABS plastic with a steel mechanism. The minutes are printed in black around the core to indicate the timing. Perfect for any kitchen, a wonderful addition to your kitchen utensils.